The rules on how to import a car into Guatemala changed in 2013. The following information is from 2010. Use the formula below to get an approximate total of your tax. The following information was provide by our good friends at Gramajo y Aguilar Customs brokers at the El Carmen/Talisman border crossing. If you would like to import your car we highly recommend this company. We have imported several cars with them and they do excellent work. http://www.a1autotransport.com is a USA based auto transport company that ships to and from Guatemala as well as other international destinations. Visit their website or call 1-800-452-2880 for more information or to get a price quote. Ok here is the formula for calculating your import tax. 3. Take the “Average Trade in Value” and add $880.00 to it. This fee is added to all imported vehicles value. 5. This amount is the base value you will pay taxes on. 7. The amount you calculate is the tax you will pay to import your vehicle into Guatemala. 8. To this amount add Q500 which is the cost of the paperwork (Tramite) to import your car. You will pay this amount to your customs broker. Q5713.92 + Q500 = Q6213.92 Total amount including paperwork at the border. This information is current as of May 2010. I just finished helping a guy import his Dodge Caravan and this is what he paid in 2010. As with everything in Guatemala things change but this should give you a very good estimate of what it will cost. For current information on the new laws please contact Gramajo y Aguliar Customs Brokers. If you need additional info let me know. Trip Total: $305.00 each way. On June 1st we set sail at 6am. We traveled out of Xela toward San Marcos, the to Malacatan and ended up at the El Carman/Talisman border crossing into Mexico. This took about 2 ½ hours due to heavy fog in the mountains. At the border you need to check out of Guatemala at the immigration station which is a small blue building with 3 or 4 windows. You hand your passport to the agent he/she stamps it an off you go across the bridge into Mexico. You need to have your car fumigated at the fumigation station right across the bridge on your right hand side. Then you can pull around, park your car and go to the immigration booth which is located inside the building to your right. You will need to fill out immigration forms so bring a pen and your passport. The agent will stamp your passport and give you an immigration form that you will need later to pay your tourist tax. They may or may not inspect your car at this stop. Once you are finished here you drive out of the border area and head uphill toward Tapachula. [SHORTCUT] Go LEFT after your first immigration check point. There will be a big Pemex gas station take the road to the left of the station. This road is about 20km, it bypasses downtown Tapachula and it ends right at the vehicle import station!! You will need to show and have copies of: Vehicle Registration, Passport, Driver’s License, your immigration form (received at the border) and a valid credit card (which is used to pay a $32.00 import fee). All of the names on these items need to match the person importing the vehicle. We also took a copy of the car’s title with us NOT the original just a copy. [IMPORTANT] You will need to know where the VIN is located on your car because they do a visual inspection to be sure the registration and the car’s VIN match. It took 3 of us about 10 minutes to find our!! It was under a carpet flap on the front passenger side floor board! If you are entering Mexico as a tourist you can pay your tourist tax at the vehicle import station, the fee as of May 2007 was around $25.00 USD per person. You must pay this tax before exiting Mexico and it can be paid here or at many different banks along the trip but why wait pay it now. If you are entering as a transmigrate, which I do not recommend, you can only pay this fee at one of the banks listed on the immigration form. We made the mistake of entering as transmigrates on a Friday which caused us some delays as we stopped at a couple banks and were told they can only do the transaction from 9 to 3pm M-F. Do not make the mistake I made just enter as a tourist, it is easier. When you enter from the USA there are banks at the border where you can pay the tourist tax easily. If you have all your paperwork in order this process can be painless and quick. In all it took us about 30 minutes to complete. June 1st 2007 10:30am 13 hours total – Our goal was to reach Acayucan, Vera Cruz our first day which turned out to be an easy goal. The road out of Tapachula all the way to Arriaga is 4 lanes of well marked freeway. From Arriaga to Tapanatepec is also good road but they are still working on it. Tapanatepec to La Ventosa is under some heavy construction, there were not many delays but you had to take it easy as the road was torn up. La Ventosa to Acayucan was probably the most improved section of road from my last drive in 2004. There were many sections of wide road on uphill stretches where the trucks would pull over and let you pass. Some areas were still under construction and others had not been touched yet, but in all it was a vast improvement. We arrived in Acayucan at 7:30pm and stayed at the Hotel Kinaku: Cost 590 pesos – $56.00 for 2 adults and 2 children parking and taxes included. The hotel has free wireless Internet in the lobby and a 24hr restaurant. The restaurant has very good service and the food was excellent. They have a pool which the kids enjoyed! 9:30am we got a late start on Saturday because we slept late and had a nice breakfast in the hotel restaurant. Mary had to visit the Waldo’s “Todo un Precio” store across the street from the hotel. As it turns out everything in Waldo’s was 11.40 pesos or roughly $1.00 USD. She got us some drinks and some good snacks for the road. When you leave Acayucan you get on a great 3 ½ hour toll road which goes directly to Vera Cruz. [SHORTCUT] Thanks to Dave Doss [http://www.mayamission.org]. Before you get to Vera Cruz watch for signs to Paso Del Toro. Take the Paso Del Toro exit, pay the toll but do NOT get on the toll road. Make a really sharp left onto the FREE road Highway 180 headed towards Santa Fe. Stay straight on this road for 20k or so, through the large 5 or 6 way interchange until you hit a new toll road going to Cardel. You have now bypassed Vera Cruz and are north of the city. GREAT shortcut – Thanx Dave!! Our plan had been to stay along the Costa Esmeralda (Nautla) at one of the beach hotels. Unfortunately it was Saturday and many places were full. If it had been a weekday I am sure we could have found a pretty inexpensive place to stay. We saw signs for double rooms with prices of 350 pesos, 450 pesos…etc. The hotels we checked all wanted around 900 pesos for the night and several had no rooms available. The kids REALLY wanted to swim in the Gulf so we ended up stopping at the very last beach area which turned out to be great. Right before the road turns left away from the Gulf there is a very small town called La Guadalupe. In between the shops selling fruit and inflatable rafts and beach toys there are short roads leading down to the beach. The 2nd one leads you to several beach restaurants, we just loved the one on the right which did not have a name but had little palapas right on the beach and shaded parking for your car. We had garlic fried fish and shrimp with papa fritas, beans and tortillas plus 6 ice cold Coronas! It was great and all for 300 pesos!! The kids loved swimming in the Gulf and we had a nice relaxing lunch. We ended up spending about 2 hours here then got back on the road and drove north. We drove north and caught the Toll road leading to Poza Rica and Tuxpan. We decide to get off the toll road and take the free road through Poza Rica instead of taking the toll all the way to Tuxpan. On the way back we took the toll road all the way and it was better (see the return trip for details). The free road winds through Poza Rica but is well marked. Once you are through Poza Rica head toward Alamo. The road is in ok shape but every town along the way has constructed “Topes” (speed bumps). Most are well marked but keep an eye out for them. After Alamo you go through Cerro Azul, Naranjos and keep going until you reach Tampico Alto. We arrived in Tampico Alto around 8:30pm – Total driving time: 11 hours. We did not go into the small town because on the main road there are 2 hotels and a couple restaurants, along with a Pemex station and a convenience store. We stayed in Hotel El Corral 250 pesos approx. $24.00 USD for 4 people. It was an ok hotel with AC but not as nice as the one across the street which was 350 pesos but it was full. June 3rd 2007 we got an early start this day around 7am. We headed north and missed the bypass around Tampico. It is hard to find as it is not well marked. To find it you need to watch for signs going to the town of Cuahtémoc which is on your left. When you see them you need to keep going another km or so and turn around at the Pemex station to catch the bypass road. We missed it completely and found ourselves in the middle of Tampico. We followed all the signs to Altamira and about 45 minutes later we were out of Tampico and back on track. Once you pass Altamira head toward Manuel/Ciudad Victoria. When you hit Manuel you need to go right toward Aldama. In Aldama you need to watch for signs to Soto La Marina. Here you keep going until you hit Highway 101/180 at La Loma, here you go right. There is a large Pemex at the La Loma intersession it is good place to stretch your legs. The road in general is in good shape but is narrow in spots and under construction in other spots. It looks like they are going to make a large part of this route into a 4 lane highway which would be nice. After La Loma the road is wide and straight all they way to Matamoros. You will need to follow signs to San Fernando, but do not enter the town. Once passed San Fernando you watch for sign to Matamoros. As you get closer to Matamoros you will start to see more and more commercial buildings and homes. If you are returning to the USA you MUST stop about 20 km outside of Matamoros and turn in your vehicle sticker. You MUST turn this sticker in and cancel your MX vehicle permit at the road side inspection station. If you do not do this, the next time you enter MX with a car they will ask you what happened to the car you brought in last time! This can be a costly mistake, believe someone who knows! When you get into Matamoros follow signs to the International Bridge and El Centro. You will eventually come to a large commercial shopping area, keep and eye out for the HEB grocery store on your left. At this intersection/stop light you will want to go right and take the road beside the overpass toward the international bridge. At the international bridge you wait in your car to pass through immigration and a possible customs check. We just showed out passports and the agent said welcome to the USA! The trip back was pretty uneventful. We already had our paperwork done so we did not need to redo it. However, if you are entering MX from the USA with a vehicle you need the following: Car Registration, Passport, Drivers License and immigration forms. The nice thing about the USA/MX border is the building is nice has A/C, bathrooms, copy center, banks…etc. You will need to stand in a couple lines but the people were helpful. Ideally I would go to the border the day before you actually leave and get all of this paperwork done. Then the following day get an early start. Our 1st day, we left around 10:00am and we stayed at the same hotel in Tampico Alto El Corral $24.00/night. We even ate at the El corral restaurant which was very good. Tampico Bypass: as you begin to enter Tampico from the North you will come upon a well marked bypass going off to your right. I would recommend taking this bypass and just following it toward the town of Cuahtémoc, this will save a good deal of time. Our 2nd day we again stopped at the fish place along the Costa Esmeralda and then keep moving south to Acayucan where we stayed at Hotel Kinaku: Cost 590 pesos – $56.00. On this day we took the new toll road that you catch when you go to toward Tuxpan. This road is the bypass around Poza Rica and is well worth the time. In Tuxpan just keep following the sign to the toll road, you will wind through town but will end up on the right road. Our 3rd day we drove pretty hard and decided to make it all the way back to Xela. 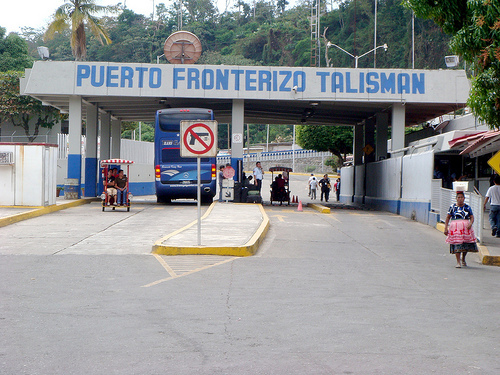 We reached the Talisman/El Carmen Border at around 6:00pm and were back in Xela at around 9:00pm. Home at last!! This was by far our easiest driving trip. The entire trip was great even the kids enjoyed it, sort of!! If you want more details about driving to Guatemala send me an email.